"I'd like to set every gemstone known to man before I pass," she says. And just how many would that be? "Hundreds of thousands, I assume," which virtually assures her of a long and fruitful career. Crevoshay, of Albuquerque, N.M., has collaborated with 10 North American lapidary artists who sculpt or engrave precious stones for an exhibition, "Voices of the Earth," that opens Sunday at Carnegie Museum of Natural History. The group "illuminates the incredible talent in my generation," she says, and illustrates a strong art and design renaissance currently taking place in this country. Best known for her eye for color and work with unusual gemstones, Crevoshay's museum collection, in a sense, transcends time. The styles and techniques of contemporary lapidary artists add a new dimension to stones that are literally thousands of years old. Crevoshay commissioned gem cutters to engrave a variety of images — from an angel to a prehistoric fish or a honeybee — on a colored stone to reflect the common theme. She then crafted a setting around it "that mirrors it, perhaps with symbolism." The imagery she seeks in her creations often combines with what she calls "an historical, mythological impact. I might have connections to a certain period of time when intaglio was used — Roman, even Victorian. At different periods of time in jewelry, this art form was thriving." She is somewhat reluctant to choose the piece she likes best. "They're kind of like your children," she says. "Who's your favorite?" But admittedly she favors a beautiful brooch she named "Psyche," which she created with Arthur Lee Anderson of Fredericksburg, Va. It's an elaborate butterfly fashioned from a large gold citrine surrounded by blue sapphire, sunstone, opal, yellow sapphire and iolite accents. It is truly exquisite. Another creation, "Aphrodite's Mirror" by Thomas McPhee of British Columbia, features a large piece of quartz set in a gold cutout frame, coupled with two pearls and citrine. 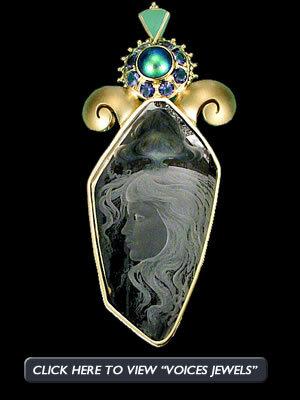 Charles Kelly of Tucson, Ariz., has collaborated with Crevoshay to create "Earth Angel," an brooch featuring one large moonstone, four smaller moonstones and tanzanite. The variety of artists represents a wide range of localities, but they all share a common thread of paying tribute to the earth, according to Crevoshay. "This particular collection is so unique and special," she says. "Many top collectors of my work have gobbled up one-third of it already." The pieces in the collection are for sale, with the stipulation that they will travel to museums for one year before they are released. Crevoshay has lived and studied all over the world. Born in Baton Rouge, La., she was "raised all over the Southeast" and spent three years in India and 12 years in Asia. She received a bachelor of fine arts degree at Virginia Commonwealth University and a graduate degree in painting and printmaking from the University of Wisconsin at Madison. She made the transition from painting to jewelry naturally, she says, having always had a fondness for gems and metals. "I had costume jewelry since age 3," she says. "All of my mother's friends would give me their old pieces. I loved jewelry. Once I got to India, I was living in a community of jewelers who practiced the art of ancient metal workers. Living in Asia really capped it all off. I was smitten by it, and started creating and selling jewelry as well." This melding of modern and ancient jewelry-making techniques has produced an exhibition of which Crevoshay is extremely proud. "I love to connect to the ancient masters and acknowledge the jewelry that has over 5,000 years of history," she says. As for her "Voices of the Earth" collection; Crevoshay says the pieces represent "one-of-a-kind, handmade, outstanding collectible gemstones. It's history in the making." Crevoshay made history of her own when she designed a ring containing the largest known faceted red (Red Beryl) emerald. The ring is now part of the permanent exhibit at the Smithsonian Institution's Great Hall of Gems in Washington, D.C. Her exhibit in Pittsburgh represents her second museum show. "It's very special, because it is the first time so many artists have collaborated on a single theme," says Marc Wilson, collections manager and head of the Carnegie's Section of Minerals. "It's interesting to me how each artist presents his views of the diversity of life on earth." Wilson says that, while few visitors "will be able to recognize the rare combination of talent that went into crafting this exhibition, they can appreciate the stunning beauty of the pieces — and that's what it's all about." After its three-month run in Pittsburgh, "Voices of the Earth" will move on to the Gemological Institute of America in Carlsbad, Calif., as part of its year long tour.